It’s very obvious at this point that Marvel are big fans of letting their wildly successful movies influence their comic books. Case in point? Just as Daredevil season two hits Netflix in March, we’re getting a digital miniseries that will see the Devil of Hell’s Kitchen and the Punisher pitted against each other. 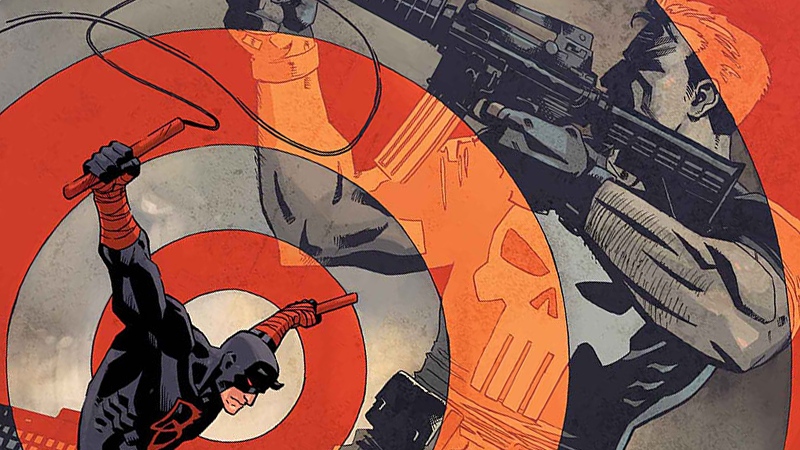 Written by Charles Soule, with art from Szymon Kudranski and Reilly Brown, the five issue miniseries revealed by Comic Book Resources today will see Daredevil and his new partner-in-punching-things Blindspot faced with the wroth of Frank Castle, when the Punisher descends upon New York once more. Obviously, this isn’t the first time Matt Murdock and Frank Castle have ever gone up against each other. Their past clashes have formed the inspiration for their upcoming tussle in the Netflix series, like the noted callback to Garth Ennis’ “Welcome Back Frank” arc we’ve already seen in promo pictures. But the timing is very obvious here: the aptly titled Daredevil/Punisher will first release digitally in March to coincide with the Netflix show’s release on March 18th, before heading to shelves in April.